Just over a week ago I wrote about the acrobatics taking place in our garden, as opportunistic squirrels hang and swing at improbable angles from our carefully squirrel-proofed bird feeders. These feeders have undoubtedly increased the number of birds in our garden - which was our primary aim - but a by-product has been the increase in breaks from our work being spent at a window, chuckling and cheering at this new entertainment. I ended my post by saying that as far as squirrels and food are concerned, no mission is ever impossible... And indeed, squirrel cheekiness and determination have combined to ensure this is so! 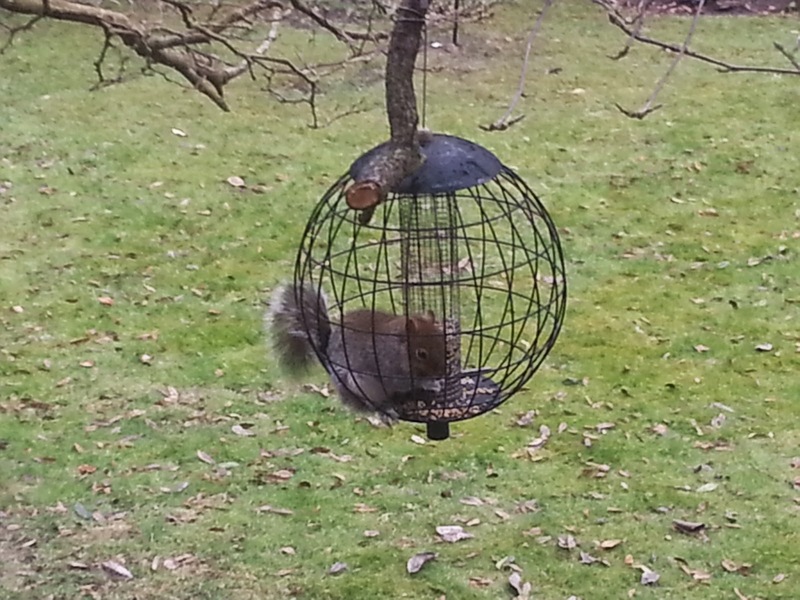 The gaps in this cage may well be small bird-sized, but if a squirrel can poke its head in somewhere, you can be sure the rest of its body will somehow make it through as well - especially when the reward is a nourishing supply of seeds which can be eaten in comfort, without having to dangle dangerously from a feeder! So we chuckle and cheer, and then bang on the window while the squirrel, blissfully and busily oblivious, munches on, only taking fright if we rattle and bang the window open. Then it somehow squeezes itself out (maybe regretting those last few mouthfuls?) to scuttle off and find the next course somewhere else. And we, who want only to feed the birds, are left exasperated - but also amused - at the cheeky determination of our uninvited guests.